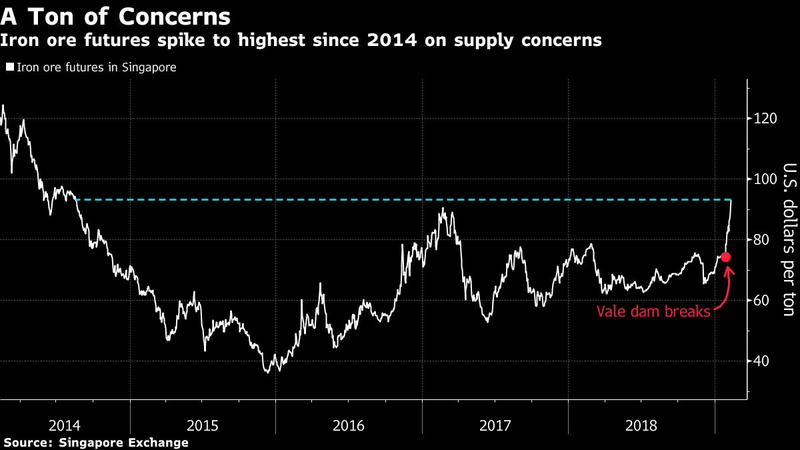 Iron ore futures surged more than 5 percent to hit the highest level since 2014 on concern that the increasingly severe crisis at top producer Vale SA will curtail global supplies, tightening the seaborne market and offsetting the impact of a slowdown in China, the largest importer. Vale invoked force majeure earlier this week after a judge forced it to suspend some operations at its Brucutu mine in Brazil — a move that it said would result in an annual production loss of 30 million tons. That’s on top an earlier reduction of 40 million tons following a deadly dam burst. In addition, Vale’s license to operate a dam at Brucutu was revoked by a state regulator. Iron ore has been supercharged since late January after the dam burst in Brazil, which killed at least 150 people and rattled the mining industry. The exact extent of the lost production isn’t clear as Vale has said it’ll be able to offset some of the impact by boosting supply from other sites. As the crisis has intensified, banks have raised their price forecasts, with Citigroup Inc. boosting its 2019 estimate 40 percent to $88 a ton and raising the possibility that the disruption to Vale’s operations may yet worsen and could last for years. A major risk is that the Brucutu operation may be “the first of many of Vale’s mines to see its production halted,” and there’s also the prospect that tighter regulations may affect supplies from other miners, Citi said in a note, outlining its bull case, which carried a 30 percent probability. Vale’s production will slump 40 million tons this year, the bank estimates. Futures advanced as much as 5.8 percent to $94 a ton in Singapore, the highest since August 2014, and traded at $92 at 2:55 p.m. So far this week, prices are 8.9 percent higher after surging 14 percent last week. Shares in Australian miners Rio Tinto Group, BHP Group and Fortescue Metals Group Ltd. fell on Friday even as iron ore surged above $90 a ton. Over the full week, the trio remain higher, with Rio posting the fourth weekly gain in five.